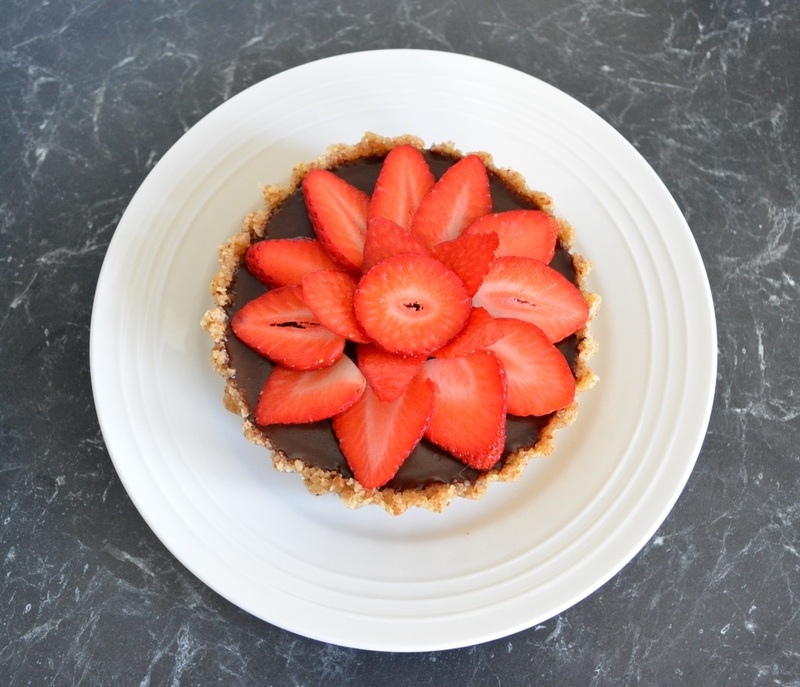 When I first made my other chocolate tart recipe with the Oreo crust I had some leftover ganache so I thought I'd try this one in mini form, just to see if I liked it. Well I did, so I thought I had to try to make it again in full size. This one is gluten free. Now sometimes I get disappointed when I try gluten free recipes, but not this time. This is delicious. My daughter actually prefers this version to the Oreo version, she says it reminds her of Ferrero Rocher chocolates. My husband who doesn't usually eat chocolate desserts, asked for seconds. The pecan base is deliciously nutty, I added the salt to the original recipe to counter the richness of the chocolate and the ganache is one of the best I have made, delicious and sets beautifully, but never goes too hard. And did I mention how easy this is to make, my goodness it is easy. A bit of blitzing in a food processor to make the base, then melt and mix the ganache. Dessert done. Very impressive dessert for something so simple to make. This is one of those desserts that will wow your guests, and only you will know how little time it took to make it, unless of course you are one of my friends, and you just read this. Use the best quality chocolate you can find. Truthfully I like Plaistowe, it is easy to find and works well when melting, and I love the flavour of it. As for the nuts, chocolate and nuts go well together. If you love walnuts or hazelnuts or any other nuts, feel free to try using different nuts in your base. I toast the nuts before blitzing in a preheated oven for about 6-8 minutes, keep an eye on it as you want it lightly toasted, not burnt. As soon as it starts to smell toasted, take it out. You will need a 23cm deep sided loose bottomed flan tin. For the base: Preheat oven to 175C. Place the pecans into a food processor along with the sugar. Blitz them together until you have coarse like sand. Add the melted butter through the feed tube, with the processor running, blitz until the ingredients are moistened. Press the pecan mixture into your tart tin and pat down firmly on the bottom and up the sides of the tin with your hands, so that the base and sides are evenly lined and smooth. Put it into the freezer (or refrigerator) to chill for 15 minutes. Remove from the freezer and bake for 12-15 minutes or until the crust is lightly toasted. Allow crust to cool while you make the ganache. For the filling: Place the chocolate and cream into a medium sized heatproof bowl. Place the bowl over a pot of simmering water, don't let the water touch your bowl. Stir frequently, until the chocolate has melted and the mixture is smooth. The mixture shouldn't be too hot. Sprinkle the sea salt flakes evenly over the pecan base. 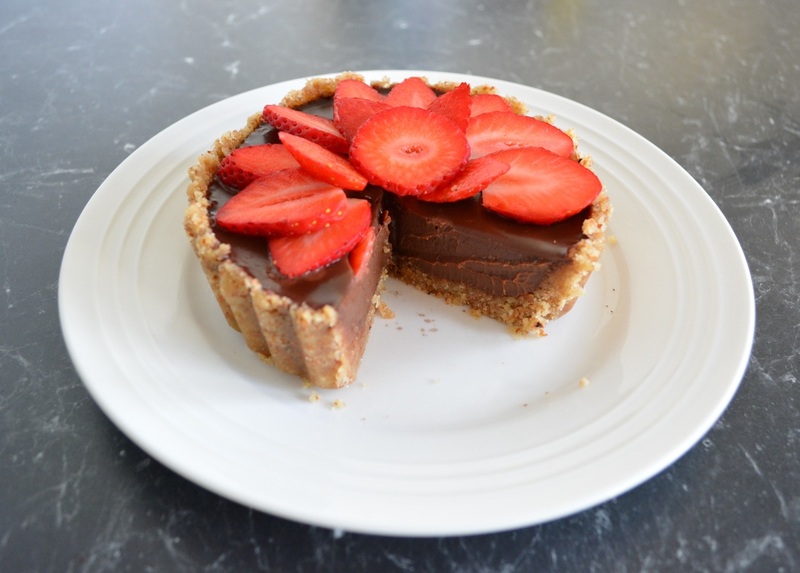 Now carefully pour the chocolate ganache into your tart tin. Refrigerate for 30-60 minutes. If decorating with the fruit, the chocolate needs to be just setting (but still be a little soft) for the fruit to stick, but not sink. So refrigerate until you can do that. Decorate however you like. After decorating with fruit place back in the refrigerator for at least 4 hours before serving. This can however be made the day before and refrigerated overnight. 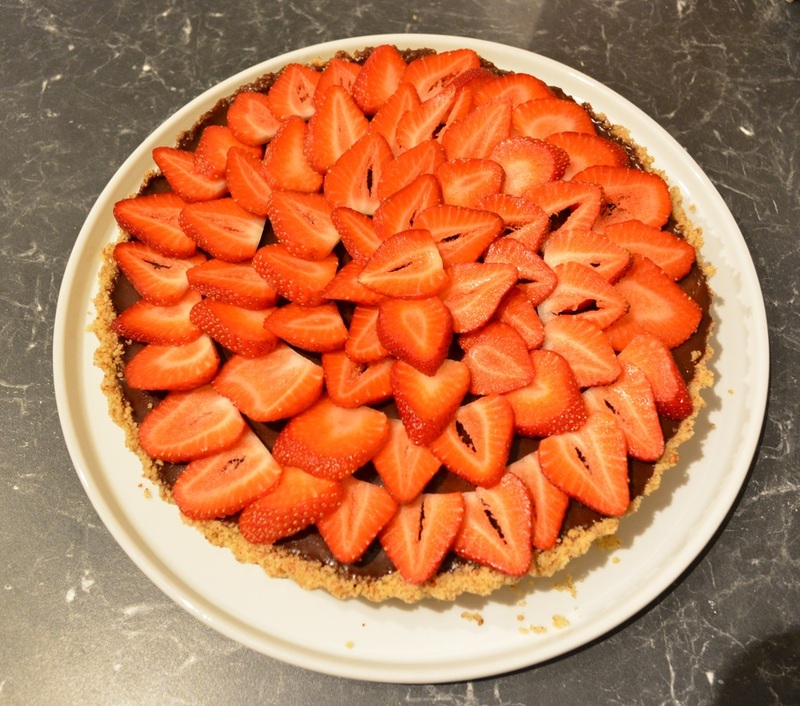 To serve, take the tart out of the fridge for 20 minutes before serving, but unmould it straight away, the tart base has to be fridge cold when unmoulding. To unmould, sit the flan tin on top of a large bowl and let the ring part fall away, then transfer the tart to a plate. Leave the base on. You can, if brave, carefully remove the base with a knife, but you need to be super gentle here, but you can also leave it on, it isn't a restaurant after all. Slice modestly, this is rich, and people can always come back for more. Serve with vanilla ice cream or freshly whipped cream if you have a sweet tooth or with some crème fraiche, the sharpness with the sweet is lovely.